Why is moving firewood such a bad idea? Tree-killing insects and diseases can lurk in firewood. These insects and diseases can't move far on their own, but when people move firewood they can jump hundreds of miles. New infestations destroy our forests, property values, and cost huge sums of money to control. Why should I be cautious about moving firewood? Firewood can carry invasive insects and diseases that can kill native trees. New infestations of these insects and diseases can destroy our forests, lessen property values, and cost a great deal to monitor, manage and control. Which firewood-related pests should I be concerned about in California? Why are non-native insects and diseases so much worse than the native ones? Native trees have evolved to survive with local insects and diseases. Likewise, native predators eat native insects and that keeps their numbers in check (environmental balance). Non-native insects and diseases have few (if any) predators, and the native trees have few natural defenses against them. Invasive insects and diseases reproduce quickly and outcompete native species. What are other states and regions in the United States doing about this issue? Some Midwest and East Coast states have quarantines that prevent you from moving firewood more than 50 miles, others don’t allow you to move wood from county to county, and some states don’t allow firewood to be transported from other states. My firewood has no visible signs of insect or disease infestation. Is it OK to transport it? There are no bugs, holes, burrows or sawdust. Is it OK to transport it? Tiny insect eggs, or microscopic fungus spores, can elude experts. These tiny threats are enough to destroy an entire ecosystem. Never assume wood that "looks safe" is safe to move. How should I dispose of my firewood if I accidentally move it a long distance? What can I do with the fallen wood and brush from my property? Firewood, brush and debris from your property pose no threat if you don't move it very far. Composting, chipping, burning or transporting it to a local disposal facility are acceptable ways of dealing with wood waste on your property. Moving firewood material long distances increases the risk. 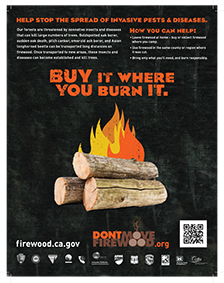 Where can I find out about firewood information in California? The Department of Agriculture has information about best management practices or rules and regulations relating to firewood. Also visit the dontmovefirewood.org website for additional information. 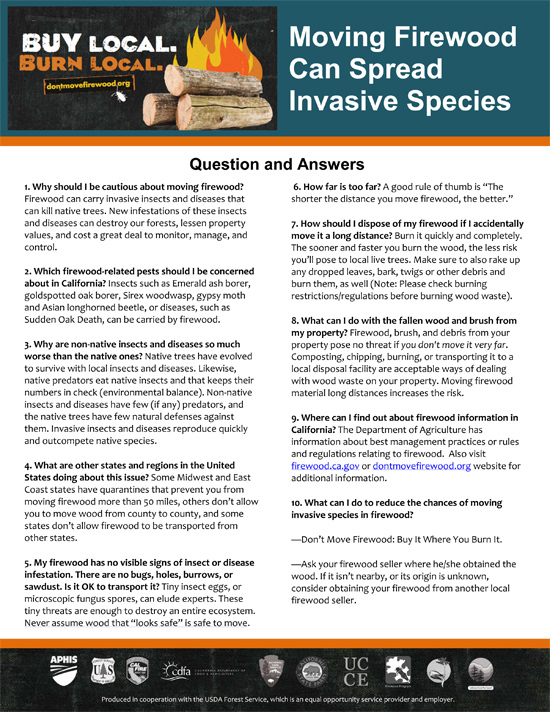 What can I do to reduce the chances of moving invasive species in firewood? Ask your firewood seller where he/she obtained the wood. If it isn't nearby, or its origin is unknown, consider obtaining your firewood from another local firewood seller. © California Firewood Task Force. All rights reserved.